ATTN: If you're interested in learning about Hungry Pop's newest interactive food experiences including mozzarella-making, wine and cheese pairing, brunch, and pizza-making, you can read more about their unique concepts HERE. Some pronounce it matza-rella, others say mutza-rella, but no matter how the word rolls off your tongue, there’s one thing for sure: fresh mozzarella is absolutely melt-in-your-mouth delicious and the ultimate cheese-pull delicacy for those unforgettable, Instagram-able moments. But seriously, who really knows what it takes to make mozzarella all by yourself? Not many, if any at all-- until now, that is. So with a little help from Hungry Pop & Kesté Pizza & Vino’s world-renowned chef and owner, Roberto Caporuscio, who was born and raised on a dairy farm in Italy (where he first developed his culinary skills that include both producing and selling cheese) alongside his skilled cheesemakers, you can now come and learn how to make fresh mozzarella-- so you can do it from the comfort of your own home afterwards! Following in the footsteps of their wildly successful and sold-out weekly event series, Make Pizza Drink Wine, Hungry Pop is proud to announce 'Make Mozzarella Drink Wine' going down at 3 PM on Sunday, April 7th, 14th, & 28th, and at 7 PM on Saturday, April 20th. Following in the footsteps of their wildly successful and sold-out weekly event series, 'Make Pizza Drink Wine', Hungry Pop is proud to announce 'Make Mozzarella Drink Wine' going down at 3 PM on Sunday, April 7th, 14th & 28th, and at 7 PM on Saturday, April 20th. Come prepared to roll up your sleeves with Roberto and the Hungry Pop team at Kesté’s Fulton Street location, where you’ll spend two hours learning how to make (and taste, duh!) 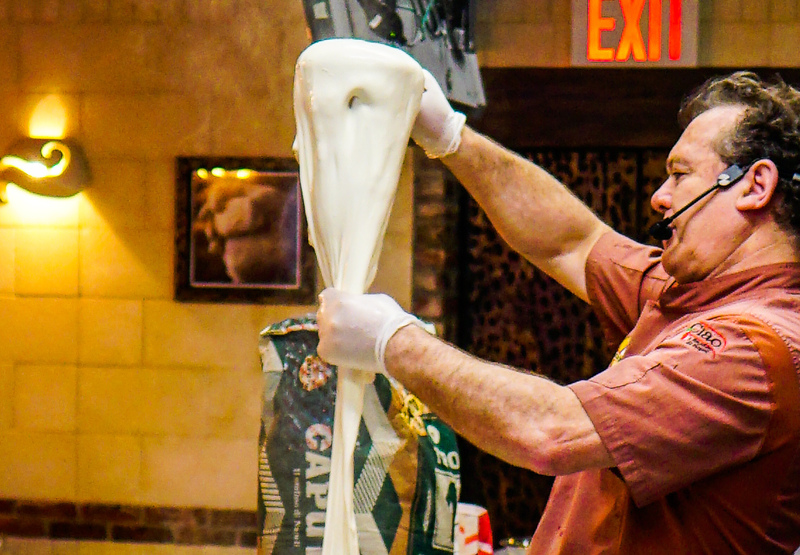 the freshest mozzarella you’ll find on the entire island of Manhattan. Not only will you gain hands-on experience from Mr. Caporuscio and his staff, but you’ll also enjoy complimentary glasses of house red and white wines for the afternoon (did somebody say, “SUNDAY FUNDAY! ?”) while learning first-hand about fresh mozzarella from this infamous dairy farmer turned Neapolitan pizza-maker. You’ll also have deliciously cheesy appetizers like fried burrata, fresh mozzarella rolled with prosciutto and arugula salad, and Neapolitan pizza served up, alongside a main dish of fresh mozzarella that you’ll help to make and top off with extra virgin olive oil. Plus, after chowing down on a lil’ doughy dessert made with everyone’s favorite midnight snack, Nutella, you may get to go home with a gift card (or three!) after being awarded as one of the best fresh mozzarella-makers of the afternoon! By the way, Roberto and his team are consistently called upon by numerous restaurants throughout the United States for private consultations and courses at which he issues certification to aspiring restaurateurs around the world-- so yeah, they're about as legit as it gets when it comes to this type of stuff. 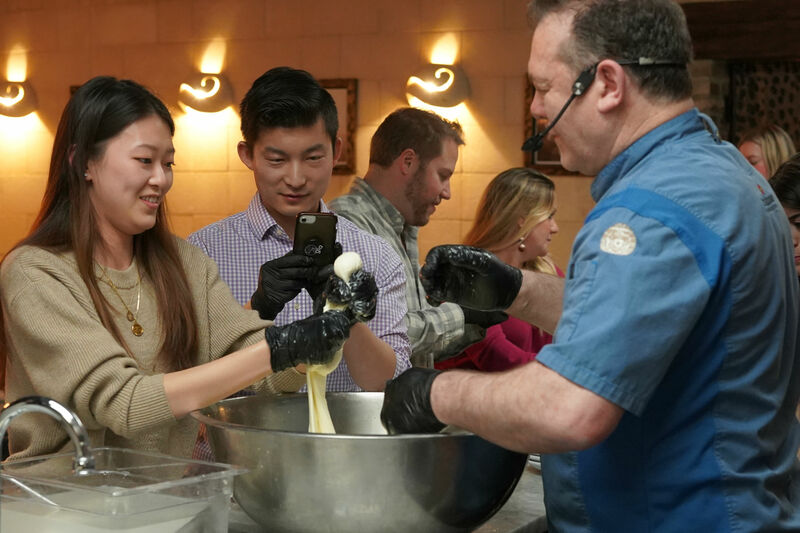 So grab your friends, family, or significant other(s) and join Hungry Pop at Kesté Pizza & Vino Fulton, located at 77 Fulton Street, on Sunday afternoons for a taste of Chees-us and test out your mozzarella-making skills. If you’re looking for the most interactive food experience unlike any other happening in New York City right now, this is it-- or, kesté, as they say in Naples! You can purchase your tickets, which start at just $85/person, right here. Check out photos and more details about the event HERE, and then take a look at some pretty amazing Instagram Stories from our previous 'Make Mozz Drink Wine' events right HERE. Enjoy 'em and we'll see you for a Sunday Funday filled with 🧀 & 🍷 (isn’t it about time for a mozzarella emoji, Apple?!) very soon! Our mission is simple: We bring people together over food and drinks. Whether the occasion simply be an evening out with friends, corporate event, date night, team-building outing, or birthday party, Hungry Pop gets it done. Right.